Van Deventer-Maas Stichting hold 23rd Regional Meeting on 13th – 15th October 2017 in Gorontalo. The event attended by 40 students from State University of Gorontalo, 2 VDMS alumni in Gorontalo, PIC from UNG Pak Udin Hamzah, S.Pd and Annisa Taqwa Zazi Muslim as alumni VDMS from Hang Tuah University that take a part in the sharing session. As the representative of UNG, Prof. Dr. Hasanuddin Fatsah, M.Hum (Vice Rectof of IT and cooperation affairs) gave high appreciate to VDMS that support their students with scholarship, capacity building and especially this year the number of grantees increase to be 41 students. 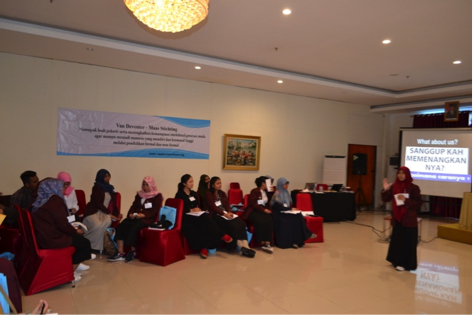 First session seminar about “Career Plan – Goal Setting (Know Yourself) by Dwiani Fegda, MPSi. She started by introducing a challenge called “VUCA world” that have influence in people life nowadays. VUCA is acronym used to describe or reflect on the volatility, uncertainty, complexity and ambiguity. Actually this challenges more for business life, however nowadays it also influence to everyone and it must be known by the students before they graduate and going to professional life. Ibu Ani also delivered the topic about “Communication skill and selling yourself ”. How to write a selling Curriculum (CV) Vitae, preparation before face the interviewer and dress up, then interview simulation. The second speaker is Pak Ibnu Suryana with topic “Basic Leadership”. Pak Ibnu delivered his material and more talk about functions of the leader. The speaker also explaining about goal setting, task for the participants in second day that they have to make their own goal, makes action plan then target date. Sharing session by Annisa that delivered the topic about “Merdeka dari pengaruh obat-obat terlarang”. When delivered the material, she shared everything about her own experience as a counselor and what she face as detail. All the students gave more attentions in her session because some new topics that they never get before. We also have SMS presentation and alumni presentation in the last session and we invite all grantees and alumni to join excellent writing club.